If you've even driven around Curacao, you know street signs are non-existent - and on this day I was hopelessly lost, and hungry. 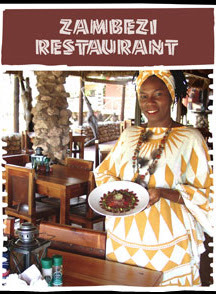 I had read about the Ostrich Farm, and knew they had an on-site African styled restaurant. Seeing the sign, I made the turn with the intention of having lunch, a cool drink, and getting directions back towards the capital city Willemstad. Four hours later I realized this was one of the more interesting inter-active animal attractions I had visited in the Caribbean. We've all seen these big feathered birds on TV, however I had no idea just how BIG they are - thank goodness they are unable to fly! Did you know the ostrich is the world's largest bird? Along with South African cuisine, Zambezi offers ostrich burgers - steak - and croquettes. On this particular day the last thing on my mine was dining on ostrich - instead I opted for a delicious bowl of African pumpkin soup, along with a very tasty vegetable quiche. The atmosphere was very relaxing - after lunch and a little shopping, I decided on the Safari Truck Tour to view the grounds. The tour guides spoke both Dutch and English and were very informative. Aside from the Ostrich, huge pot-bellied Vietnamese pigs were sleeping in the shade, and I was surprised to see Barbados Black Bellied Sheep, which are often mistaken for goats. There is also a small croc pond, however the resident croc stayed under the water, and was barely in view. And there are plenty of the local iguanas and Ameiva type lizards. Along the way everyone is invited to feed and touch the ostrich. These are the biggest eggs in the world weighing in at 3 pounds, and 6 inches in diameter. The tour ended with the tour guide giving us an education on ostrich eggs. We all were invited to stand on the egg to see how much weight it can withstand - and surprisingly no one broke the eggs while standing on them. For an additional charge, visitors can ride an ostrich. The older male birds are very aggressive, and young males or females are used for riding. Ostriches are fascinated by gleaming objects. We were told to take off any shiny earrings when feeding as the ostrich will rip it from your ear - Yikes! The ostrich has the largest eye of any land animal. In Curacao the ostrich are bred and raised for human consumption. I was told ostrich tastes a lot like beef, has less fat along with being low in cholesterol, and high in protein and iron. Nothing goes to waste at the farm - leftovers are fed to the pigs and croc's - and ostrich bones, egg shells and feathers are used for crafts. What else I learned at the Curacao Ostrich Farm . . . Unique and valuable information is shared about ostrich as more valuable is the lifestyle described here that helps people to enjoy their travel life by creating such unique plans.